Title: 02/01/1994 - Hazard Communication Standard and Material Safety Data Sheets. James J. Balsamo, Jr., C.S.P. Thank you for your letter of July 27 concerning the requirements under the Occupational Safety and Health Administration's (OSHA) Hazard Communication Standard (HCS), 29 CFR 1910.1200, for Material Safety Data Sheets (MSDS). Please accept my regret for the delay in responding. Your questions will be answered below in the order they were presented in your letter. Situation #1: Can a central repository of MSDS be kept at one location in one of the buildings that support seven buildings? Situation #2: ... fifty buildings are on city blocks which are all contiguous in a five square block area, with the same personnel and security situation as noted in situation #1 above. Can a single MSDS repository serve all these buildings? Situation #3: ... does a single repository provide for each building with security having twenty-four hour a day access to them for all departments in that building meet the intent of the OSHA regulations? The key to compliance with the HCS is that employees have no barriers to access to the information and that the MSDSs be available during all workshifts. The HCS is a performance oriented standard. A performance-oriented standard gives employees the flexibility to adapt the rule to the needs of the workplace situation, instead of having to follow specific rigid requirements. Situations #1, #2, and #3 would have to be evaluated within the context of the employers Hazard Communication Program. As you know the HCS specifies that MSDS must be maintained on site and readily accessible during each workshift to employees when they are in their work area(s). Again, the situations you describe above could meet that requirement as long as there are no barriers to employees accessing the MSDSs. 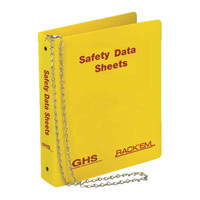 Make your MSDS collection "readily available" with binders from Safety Emporium. Question 2: Specific chemicals such as acetone, xylene, etc. do not always come from the same manufacturer and each manufacturer supplies an MSDS for their chemicals. Is it necessary to have in the central repository copies of all MSDSs from each company or could one complete MSDS serve the needs for all acetone, etc. user for routine purposes, emergency situations or both? Given the performance oriented nature of the standard, an employer must be certain that employees are provided all the necessary information concerning the hazards of chemicals in the workplace. There are a number of concerns with the approach you describe. First, you must ensure that the specific identity on the MSDS can be cross referenced to the corresponding label of the hazardous chemical containers. Second, the employer must ensure that employees are informed during the hazard communication training of this practice of using one MSDS as representative of all vendors, otherwise it could lead to confusion. Third, the MSDS you select must have complete and accurate information as required by section (g)(3) of the HCS. And finally, the standard requires that the MSDS contain the name, address and telephone number of the party who prepares or distributes the MSDS. The party listed must be able to provide additional information on the hazardous chemicals or clarification of the information on the MSDS, as well as, additional emergency procedures, if necessary, in lieu of the actual manufacturer. A chemical manufacturer, importer or distributor may not wish to and is not required to act as the responsible party for a chemical that they did not produce. Question 3: If your answer to situations #1 and #2 above is "No" but "Yes" to Situation #3, how does this affect your response to question #2 above? We believe our responses to questions 1 and 2 address your concerns. Question 4: Does using, in an emergency situation, one MSDS from, for example Sigma/Aldrich's CD ROM constitute compliance with the OSHA standards? 1. You don't know the manufacturer but only the name of the chemical to which the person is exposed. 2. You don't know the manufacturer's name and the chemical name, however, the Sigma Aldrich CD ROM access is the fastest way to get the chemical information to those who need it, until the specific MSDS, chemical and/or manufacturer's name, are obtained. You describe a situation where the company is not in compliance with the HCS; the employer does not have essential information about hazardous chemicals in the workplace. The CD ROM alternative that you described would not meet the HCS intent. The HCS requires that employers have an MSDS for each hazardous chemical which they use. Part of the employer's Hazard Communication Program is to ensure that all MSDSs are maintained and that "good faith efforts" are taken to acquire missing MSDSs from the chemical manufacturer, importer or distributor. The specific chemical's MSDS itself, not just "MSDS information" must be available to workers. If the MSDSs utilized in your electronic system are specific to each product and contain the same chemical identity as used on the required label of the chemical, so as to allow cross referencing between the two, then this aspect of your system would meet the intent of the standard. If the MSDS provided is not product specific, the intent of the standard would not be met. We hope this information is helpful. If you have any further questions please contact Tom Galassi at (202) 219-8036. I have read recently several OSHA abstracts and OSHA communications that answered specific questions related to the Hazard Communication Standard. They were written by you and other OSHA representatives. I have four direct questions that I, as a consultant in occupational safety and health, have been asked. 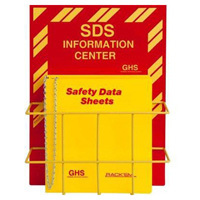 Can a "Central Repository" of Material Safety Data Sheets be kept at one location in one of these buildings that supports all seven buildings, i.e. the workplace, as long as everyone knows how to get access to them and access can be accomplished twenty-four hours a day by contacting the security office who can take the person to the MSDSs and open the room where they are kept? Security is a twenty-four hour a day, seven days a week, operation for all the seven buildings in question. They have keys to the MSDS Repository. Another scenario is that fifty (50) buildings are on city blocks which are all contiguous in a five square block area, with the same personnel and security situation as noted in Situation #1 above. Can a single MSDS Repository serve all these buildings? If your answer is "No" to Situations #1 and #2 above, does a single repository provided for each building with security having twenty-four hour a day access to them for all departments in that building meet the intent of the OSHA regulations? In the "OSHA Instruction, CPL 2-2.38B" referenced in a letter from you, dated July 6, 1990, to Ms. Betty J. Dabney, Ph.D. it states that "The MSDS used in an employer's hazard communication program must be specific to each chemical used on-site." Please be aware of the fact that there are several bottles of specific chemicals, i.e. acetone, xylene, from different chemical manufacturers that are used in the various laboratories in the "workplace" as noted in question #1 above. Each manufacturer supplies MSDSs for their chemicals. Is it necessary to have in the Central Repository copies of all MSDSs from each company or could one complete MSDS serve the needs for all acetone, etc. users for routine purposes, emergency situations, or both? If your answer to Situations #1 and #2 above is "No," but "Yes" to Situation #3, how does this affect your response to Question #2 above? You don't know the manufacturer but only the name of the chemical to which the person is exposed. You do know the manufacturers name and the chemical name, however, the Sigma Aldrich CD ROM access is the fastest way to get the chemical information to those who need it, until the specific MSDS, chemical and/or manufacturer's name, are obtained. Thank you for your time and consideration in this matter. I will await your prompt reply. Get custom chemical storage cabinets and more at Safety Emporium.